The best tomatoes are the ones you have watched grow!! 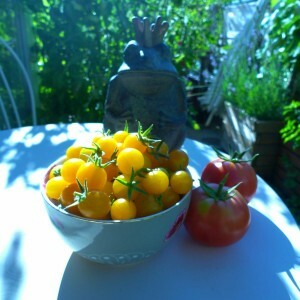 My balance up to now: 2 kg tomatoes from 6 plants. Since I can’t eat all of my harvested tomatoes I just put them as they are (not cut) into a freezing bag and FREEZE them. This way you have tomatoes throughout the hole year for making the best tomato sauces you can imagine. Just put a bit of water in a pot and thaw tomatoes over medium heat until they fall appart….